Ashleigh is part of the Wealth Law team at Evans Dixon. Her primary focus is estate planning, including assisting clients with the drafting of Wills containing discretionary testamentary trusts, enduring powers of attorney, and other associated documentation. Ashleigh has expertise in preparing complex Wills with a focus on asset protection and greater flexibility in relation to inheritance. She assists clients to preserve their wealth for succeeding generations by developing and implementing tax-effective strategies. She also has experience with establishing special disability trusts for clients who have responsibility for managing the specific needs of beneficiaries who require additional care and support. Ashleigh is an accomplished probate and estates lawyer who has instructed Counsel at the Supreme Court level. Prior to joining Evans Dixon, Ashleigh exclusive worked as an estate planning lawyer at a boutique law firm. 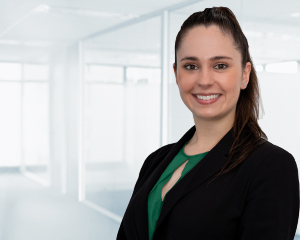 She was inspired to join the Evans Dixon Team because of its ability to offer client’s holistic estate planning advice in consultation with other financial services. Ashleigh has a Bachelor of Laws and Bachelor of Science majoring in Psychology from the University of Wollongong. She also holds a Graduate Diploma of Legal Practice from the College of Law.